NATAL, Brazil — The U.S. national soccer team waited four years for this moment, to measure progress since the last World Cup, to avenge losses against a two-time nemesis and to implement Jurgen Klinsmann’s grand plan. On an evening of extraordinary turns, bloodied noses, strained hamstrings and both early and late goals, the U.S. claimed a 2-1 victory over Ghana in their Group G opener Monday. Amid bedlam at Arena das Dunas, substitute John Brooks, 20, scored on a header in the 86th minute — just four minutes after Andre Ayew had canceled out Clint Dempsey’s goal 29 seconds into the match. Brooks, a 6-foot-4 German-American defender who replaced injured Matt Besler at halftime, stung an eight-yard downward header from Graham Zusi’s corner kick past goalkeeper Adam Kwarasey. He celebrated for a moment, then, perhaps not believing what he had just done, lay on his stomach with his face buried in his arms and the grass for an extended time. The U.S. team endured injuries to Jozy Altidore and Besler before halftime, a glaring lack of possession and constant duress to take a considerable step toward the knockout stage. Two teams from the so-called Group of Death will advance to the round of 16, and the U.S. will need at least another point from games against Portugal and Germany to remain in the hunt. 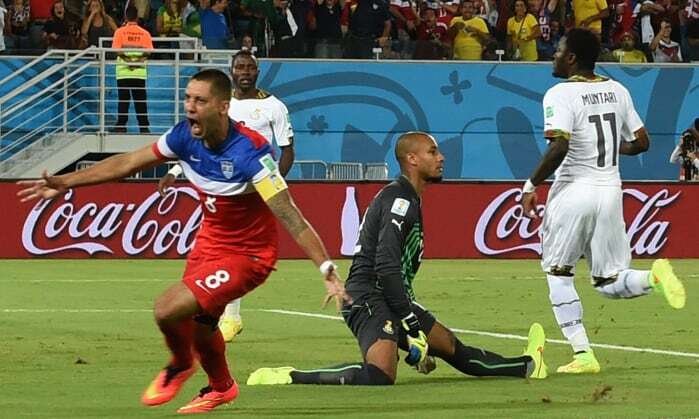 Ghana had eliminated the United States in 2006 and 2010, both by 2-1 margins. Soccer dawned early on this northeast city. Several days of biblical rain gave way to sunshine, drawing streams of visitors to Ponta Negra beach. Vendors opened kiosks on the strand while push-cart merchants peddled coconuts, crepes and straw hats. Surfers, joggers, sunbathers and soccer players staked their territory. Despite the city’s remoteness, Natal turned into Little USA. Thousands of supporters began arriving two days ago. Flags hung from seaside hotel balconies and groups gathered at open-air cafes. It looked more like Fourth of July weekend at Ocean City, Md., than the buildup to a soccer game. The difference was that those roaming the beaches were sporting U.S. jerseys. Thousands assembled about a mile away from the arena for 2 1/2 hours of pregame revelry and then a march to the match — a tsunami of red, white and blue descending on an arena surrounded by unfinished infrastructure projects. Long before departing the hotel, the U.S. squad watched Portugal’s 4-0 implosion against group favorite Germany — a thunderous result that opened the door to the U.S. or Ghanaians to advance. Klinsmann’s lineup was identical to the starters for the last friendly, a 2-1 victory over Nigeria on June 7. Tim Howard was in goal for the second straight World Cup. At left back, DaMarcus Beasley became the first U.S. player to appear in four Cups. His back line colleagues — Besler, Geoff Cameron and Fabian Johnson — were in their first. The midfield looked nothing like projections early in the year: Kyle Beckerman started at the bottom of the diamond formation, with Alejandro Bedoya on the right wing, defensive midfielder Jermaine Jones on the left and Michael Bradley, the squad’s most important player, in a two-way role. Dempsey and Altidore filled the front line. The U.S. exposed Ghana’s vulnerability in a flash. Beasley played the ball forward to Jones, who one-touched to Dempsey rushing through a channel. He toyed with defender John Boye, cutting inside to find a clear path before beating goalkeeper Adam Kwarasey to the far post from eight yards. In 2010, the U.S. had gotten into the terrible habit of conceding early goals. Now, it was their turn to deliver a quick first strike. Dempsey scored for the third consecutive World Cup, adding to his tallies against Ghana in 2006 and England four years later. He also became the fifth-fastest goal scorer in World Cup history; at 11 seconds, Turkey’s Hakan Sukur set the mark in the 2002 third-place match. The Black Stars were hardly deflated. They went after Beasley repeatedly and kept Howard busy with menacing crosses. Howard was tidy, though, and Ghana did not seriously threaten until late in the half. Two minutes after Altidore’s 10-yard shot was blocked, the powerful striker was chasing a long ball when he reached for his left hamstring. His distressed expression told the painful story. He was done for the night and, in all probability, the tournament. Klinsmann turned to Aron Johannsson, an Alabama-born, Icelandic-raised 23-year-old coming off a sensational season with his Dutch club, AZ Alkmaar. 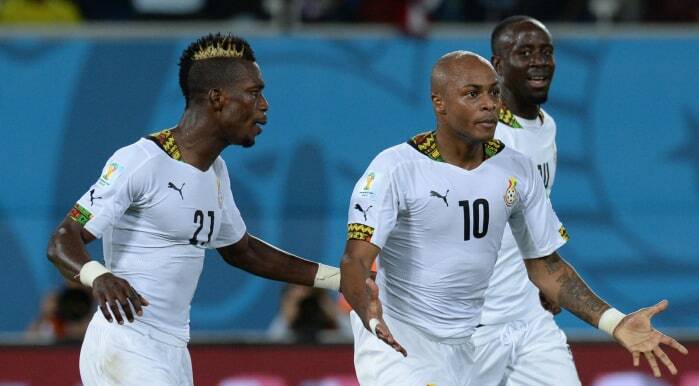 With the Americans unable to sustain meaningful possession, the Black Stars continued to mount pressure. They also continued to inflict pain. Beckerman received a blow to the head by Mohammed Rabiu, who collected a yellow card, and Dempsey’s nose was bloodied by Boye’s high kick. Between incidents, Howard was called upon to make his first quality save, going to his left to deny Asamoah Gyan’s crackling bid. 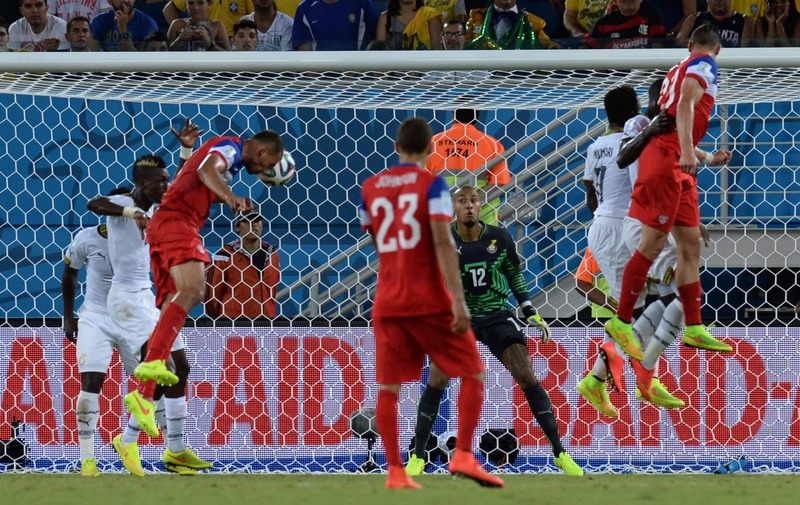 U.S. giveaways in midfield allowed Ghana to continue the assault. Adjustments needed, halftime could not arrive soon enough. Just before the whistle, Ghana squandered a golden chance when Jordan Ayew scuffed a clear shot from the heart of the box. Ghana didn’t let up. Sulley Muntari whistled a distant shot past a top corner and Gyan’s clear header missed high. Pressure paid off in the 82nd when Andre Ayew collected Gyan’s back heel, beat Johnson and spun a 12-yard shot into the near corner. Brooks, however, had the final say.